These rust textures photos were taken high in the mountains of Colorado. Old, rusted mining equipment yielded these cool textures, including rust from a pump engine fully exposed to the elements at 11,000 feet for nearly a hundred years! I hope you find these free textures useful. They are about 3800 x 2500 pixels. I like to use stock photos like these for creating backgrounds, especially for cd design work. 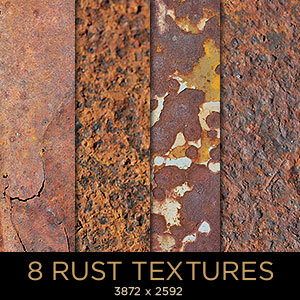 I’m happy to share these 8 rust textures for personal and commercial design work. They are my photos, so please don’t repost on another site, just link to this page. Thanks! These look good, thanks (y). These are great textures! Just what I need to grunge-up a background. Excellent, just what I was looking for. Thank you! These bring back memories of a relative’s farm when I was a girl. At various out of the way spots on their family farm, there were random piles of debris, rusted exactly in the same manner. The equipment, though, was farm related, tractors and plowing attachments, etc. Up close they look almost the same!